Since customers are the main reason for the very existence of a business, it is important to find out whether the products and services offered meet their expectations. And with stiffer competition in the marketplace for the same slice of the customer pie, organizations have to proactively get customer feedback. Doing so will help in not only retaining customers but also in building their loyalty towards the brand. Simply put, satisfied customers lead to repeat business and also offer great referrals to others looking for the same service or product. With advances in technology and the speed of doing business, companies have to find engaging methods to talk to their customers to get the right feedback – it will be worth the effort in the end. Feedback surveys are a common and effective way to contact customers and get information on what the customer like and areas of service that need improvement from a business perspective. Most often, businesses react to dropping sales numbers and negative reviews. It is important to do a survey even at this stage – to understand where things have gone wrong and fix it. The hands-on approach is better as it shows interest on the part of an organization in a customer’s experience, whether positive or negative. Why Employing A Robust Survey Strategy Is Crucial? Since there are many companies offering the same service at better prices and greater value, customers will switch if they have a bad experience. Regular surveys will help in identifying these key problem areas. Surveys are the quickest and best way to keep pace with changing customer preferences. Being customer centric will help in catering to the needs of different generations. Surveys done to rank businesses based on customer experience categorizes around 2/3 of companies between poor and okay. Companies which were active got placed between okay and good accounted for 75%. Customers are savvier than ever these days and companies cannot afford to be complacent. With online shopping -becoming the norm, it is even more important for companies to stay in touch with their customer base. Survey software can be used to design a good feedback form and renew contact with the customer at multiple levels. Thanks to the widespread use of the internet, it has become very easy for customers to express their opinions, be it good or bad. And it can be done on independent review websites. Before things take an adverse turn, companies should work on pre-empting negative sentiment and encourage customers to share opinions. Feedback surveys are a platform for customers to keep enjoying their favorite brands. Being able to design the right customer survey are critical in getting the right results. Customers have to feel motivated to fill out a survey. Thanks to the availability of survey software, the process has become much easier to organize. With tools like data analytics and social media, it is easy enough to see how a person expresses their opinions. Make sure to use every possible channel to get the right customer feedback. To get a better idea of your brand’s performance, sending out a survey every now and then and on a specific topic will help in following buying patterns. These can also be sent to get general feedback. Survey maker is especially useful in devising new topics to solicit consumer feedback. To get an idea of your company’s overall performance, it is good to receive surveys based on individual departments and possibly even agents. This will help in determining pain points and tips on how problems can be fixed. All information received after a survey, whether it is positive or negative can improve performance. If the overall score is low, then agents should reach out to that customer and find out what can be done to change their opinions. Customers are happy to offer their opinions if they are convinced that it matters. Surveys present a golden opportunity to companies with an ultimate goal of enhancing their performance. Keeping surveys short is important because customers will quit halfway if they are lengthy. Keep the number of questions to a minimum and offer customers the chance to do it online. Use scales to get an idea of how good or bad service has been. 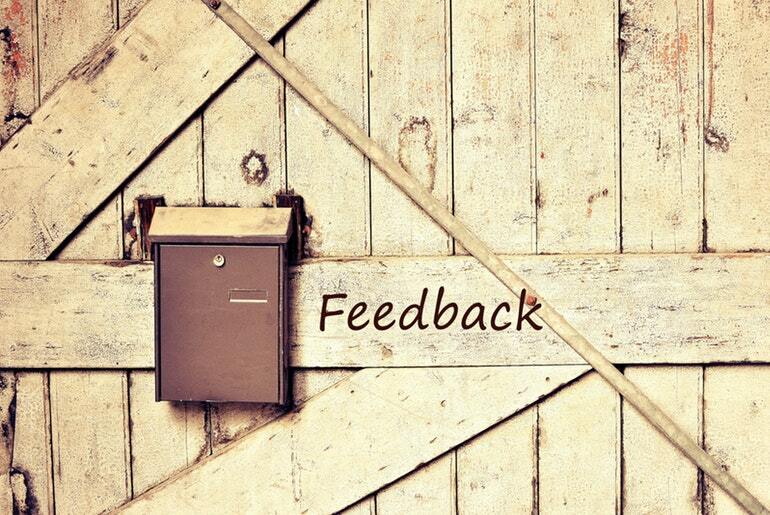 Offer customers a chance to give their feedback in a box to get insights on issues not mentioned in the main survey. Customer feedback surveys are very important for understanding your customers, what they want and expect from your brand. Paying attention to their comments will help a brand evolve and go from good to great. Companies should not pass up on the opportunity to offer exceptional service and prove that they care about their customers. Angela White is an ed-tech enthusiast with a passion for writing for the consumer market in the areas of product research and marketing using elearning software. Having a knack for writing and an editorial mindset, she has been writing for ProProfs: a brand that’s known for creating delightfully smart tools such as Survey Maker and Quiz Maker.